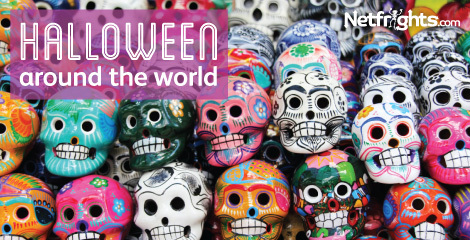 We might think of Halloween as Jack O’ Lanterns and fancy dress, trick-or-treating and scary movies, but how do other countries and cultures celebrate this festival of all things macabre? From Hungry Ghosts in China to encounters with Dracula in Transylvania, let’s go on a ghoulish world tour. Mexico’s Dia de Muertos (Day of the Dead) is famous for its decorated sugar skulls and mega ofrendas; huge, decorative altars in streets or cemeteries across Mexico, which are adorned with flowers and sweet bread creations. In Mexico City, the museums of Diego Rivera and Frida Kahlo are worth a visit. These artists were both fascinated with death, and in early November, the museums feature impressive ofrendas and special Day of the Dead exhibitions. Nowhere else on the planet celebrates Halloween quite like the USA. From A-list Halloween parties in Hollywood, to neighbourhood trick-or-treating, the whole country goes mad for the spooky stuff. Why not take a trip to one of America’s spookiest towns? Death really does bring Sleepy Hollow to life, and if you’re brave enough, there are evening tours around the haunted cemetery, where vampire Barnabas Collins is buried. Salem, meanwhile, celebrates throughout October, culminating in the highly-anticipated Witches’ Ball. Halloween, which is otherwise known as Samhain, dates back to Celtic times in Ireland. As well as a festival of the dead, in Ireland, Halloween was also traditionally a festival for those looking for love. Young women would try to peel an apple without breaking the peel, which was supposed to bring them a husband. Nowadays, Dublin at least goes a bit more mainstream, with carnivalesque parades and tours designed to give you the heebie-jeebies. While Western-style Halloween celebrations are mainly limited to the expat communities (in cities like Beijing and Shanghai), China spends the entire seventh month of its calendar, which falls during July and August, worshipping ancestors in the Festival of the Hungry Ghosts. On the 15th day, a feast is prepared, while lavish shows and lantern festivals occur throughout the month. On November 1st, Filipinos celebrate Undas, a tradition imported from Spain. This sees families spending the day at the graves of departed family members, eating, singing, and reciting the Rosary. In the capital city, the Manila Film Center has become something of a spooky sensation. It’s said to be haunted by the souls of construction workers who were buried alive in an accident in 1981. You can sometimes catch a Filipino horror flick there – if you dare. Like other Catholic countries, Brazil traditionally observes Day of the Dead (known as Dia de Finados) on November 1st. Families visit the graves of relatives with flowers, candles and other offerings. However, Brazilians have never been known to turn down the opportunity for a party, and US-style Halloween festivities are catching on, particularly in Rio. On October 31st, tourist hotspots like Ipanema and Copacabana host horror film screenings and themed beach parties. If you want a taste of a Brazilian carnival with a ghoulish twist, Halloween in Rio is for you. Where better to celebrate Halloween than in the birthplace of Dracula? The lines between fact and fiction are blurred in the gothic villages of Transylvania, and you can’t avoid vampire tales; the locals even put out bulbs of garlic on Halloween night to ward them off. Among the Halloween highlights, you can take a historical tour of the ancient castles, where the real Vlad the Impaler lived, or go Halloween mad at haunted Hunyad Castle, which hosts an extravagant costumed ball.